The Carb-Sane Asylum: Cholesterol or Inflammation? I wanted to share this study with my blog readers that I had found and shared a bit of on Twitter a little while ago. This has been prompted by ongoing discussions there and elsewhere on social media regarding blood lipids. By "cholesterol" I am of course using the general term that in today's terms refers mostly to the low density lipoproteins or LDL. This is not so much a study as a communication. It is also on the "Cardiology Patient Page" of the journal Circulation, and as such quite readable. I'd suggest any and all interested do so as I don't really have the time to go in depth into the entire thing. A key issue with the Jimmy Moore/Eric Westman book Cholesterol Clarity, that has been exhumed once again by Nina Teicholz, and even a Peter Attia appearance on the Dr. Oz show, is the Ronald Krauss driven idea that LDL-C doesn't matter, it's the particle size. Over the years I've heard "large fluffy" LDL described as anything from not-as-bad (Krauss' current descriptive) to protective, where the latter designation is clearly erroneous. It is fairly widely accepted that particle number is an important predictor, and the issue of particle size comes in when you have normal concentration carried by a large number of particles (bad) vs. slightly high concentration but carried by a small number of large particles (not so bad). Thomas Dayspring and others have made it clear that when your cholesterol is very high, size doesn't matter and all the fancy testing is unnecessary -- you are at higher risk. I discussed this here: When Size Matters (and when it doesn't) . Here's the pretty famous image demonstrating this. Note that Low vs. High designations are for below or above the median, and sadly many insisting that LDL is entirely meaningless often fall quite well above the median -- like up in the 90-some percentiles! Another buzzword that has taken hold in the IHC is inflammation. What is inflammation? Is it a physical manifestation, or is it some markers that have been designated under what has become a rather broad term? It is a common mantra these days to dismiss all potential bad-news-LDL on the basis of "I have no inflammation so it won't rupture". I'm can't help but think of Dreamfields pasta and all the low carbers who would consume it when the manufacturer told them it had carbs in it, they were just "protected". Consumers were given specific cooking instructions (hope you like your pasta al dente!) and to cook only what you planned to eat right then. Reheating is out of the question. I don't know about you, but I'd rather not eat the carbs in the first place than worry over whether they would be released in my digestive tract, and I pretty much feel the same way about atherosclerotic plaques. No, that the Masai had them and didn't have high incidence of heart attacks is of no relevance here ... unless you are a Masai living the warrior lifestyle. The gold-standard measure of inflammation at the current time is C-reactive protein or CRP for short. In some studies CRP is improved with low carb, in others, like the one blogged on here, it is increased. Still, there's a false sense of security being established out there by the advocates of low carb diets, that so long as CRP is low, everything is A-OK. Mind you, the best you'll get from an expert if you corner them is "well we really don't know" -- but this hasn't stopped folks like Jimmy Moore from making wild health claims regarding their stellar lipids (I can think of another term deriving from stars that is more appropriate). It is one thing if he, or you or anyone else wants to take a risk based on the evidence in hand. It is quite another to be making these claims and the words I'd use to describe this range from irresponsible to downright criminal. Always keep in mind that anyone can say pretty much anything in a book these days so long as they put a medical disclaimer in there. There is no filter, and even esteemed publishing houses see fit to publish anything without technical or factual review. Both cholesterol and CRP predict risk, but you cannot predict your CRP level on the basis of your cholesterol level (or vice versa). That is because each of these blood tests picks up a different component of the disease process. This independent and additive effect is demonstrated in Figure 1, which shows cardiovascular event-free survival for initially healthy individuals according to levels of both CRP and the so-called “bad cholesterol” or LDL cholesterol. The article goes on to discuss how CRP is a better single predictor. Consider this, however. This is "at baseline", not from birth. So what this may well indicate is that the inflammation follows the buildup (and that makes common sense). In other words, those with high CRP at baseline were already in the early stages of disease manifestation so it is no wonder they were more likely to develop advanced disease. It would be very interesting to see such an analysis with particle numbers instead of just the LDL-C if such data is available. 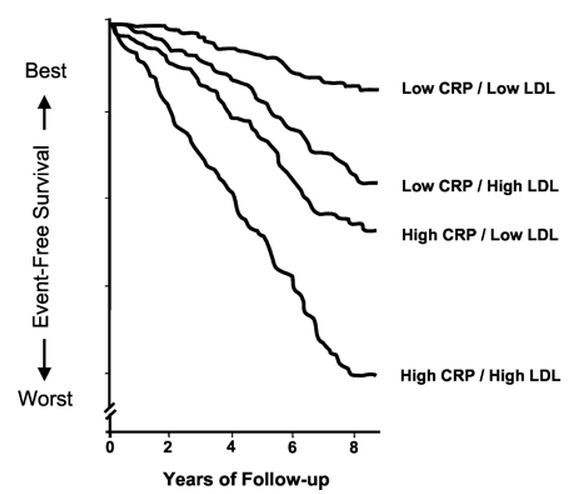 But clearly, the Low CRP/High LDL are pretty close to the High CRP/Low LDL right there in the middle of the pack. This is "high" as in above the middle, not as in some of the familial hypercholesterolemia-like LDL levels some sport proudly. It is not a stretch to consider that such a line for those types might end somewhere in the lower quarter of this graph. To me the bottom line is that we are in uncharted territory with the lipids produced on extreme diets -- and anything much over say 40-45% fat in content is pretty extreme for the vast, vast, vast majority of humans on the planet. I don't think it is scare mongering to point this out and caution my readers about the health advice being doled out in low carb circles. Yes, you are absolutely right about the nonsense that's promoted about lipids. When my hypothyroidism went undiagnosed for a few years, my LDL went up. After diagnosis and hypo treatment, it went down very slowly. When it was still high, my endo did the VAP test on particle size, and I was happy that it showed I had 100% of the large, fluffy kind which I'd been brainwashed (by low carb advocates) into believing was good. My cardiologist told me that was nonsense and that particle size is basically irrelevant. The notion that it's important persists in low carb circles and people are encouraged to ignore high LDL levels. Also, I initially bought into the 'coconut oil' is magnificent view, but fortunately because of my hypo, I get blood tests every 4 months, including a lipid panel. The wonderful coconut oil raised my LDL by 40 points in one 4 month span! My endo asked about any 'dietary changes' I'd made, and I immediately thought of the CO--and stopped using it. On my next labs 4 months later, my LDL was down those 40 points. It was definitely the CO.
And I only eat low to moderate fat--not the high fat of most low carb crazies. Since few of them are regularly tested as I am, I can only imagine (in horror) the damage they may be doing to their bodies by believing all the crap that Jimmy and his pals promote. Very interesting. I wonder how that last chart would look with the total cholesterol to HDL ratio (often shown to be a better predictor of CVD outcome) instead of LDL. Or triglycerides in place of LDL. I was pretty floored that Westman collaborated with Jimmy in the first place, but hoped he might serve as a moderating voice in that book. He wasn't. Mostly his doctor's notes range from the inane (eggs are just like whole baby chickens!) to chant-like. There is a section at the end of the book where Jimmy diagnoses peoples lipid panels and includes his own. The sole factors used for health vs. risk were HDL and trigs and Jimmy's own lipids put him in the healthy category. Sadly, the main readers of both the cholesterol and the keto books are the Jimmy Moore fan base who swallow all the nonsense that their 'hero' expounds--as the reviews on Amazon illustrate. Somehow, reviews by dissenters are getting deleted. That gives an erroneous top-heavy view of reviews. I heard some rumblings about this and am surprised that Amazon's prone to such abuse. There's already the double-edged sword of having such a flexible review policy that is prone to the abuses of organised positive reviewing within the circle-jerk. The only thing that can balance the echo chamber noise out under such a flexible policy are the dissenting opinions. Now that those very dissenting opinions are being flagged and removed, a more serious problem with this system--where product owners/creators can pretty much manipulate the customer feedback to their advantage--is becoming readily apparent. Which Micro- & Macronutrients Intakes Are Associated With High HDL Levels? Study Shows Magnesium & Folate Are, High Carbohydrate & Total Animal Fat Intakes Are Not! The Lancet recently had a special series on lipids (LDL. HDL and triglycerides). 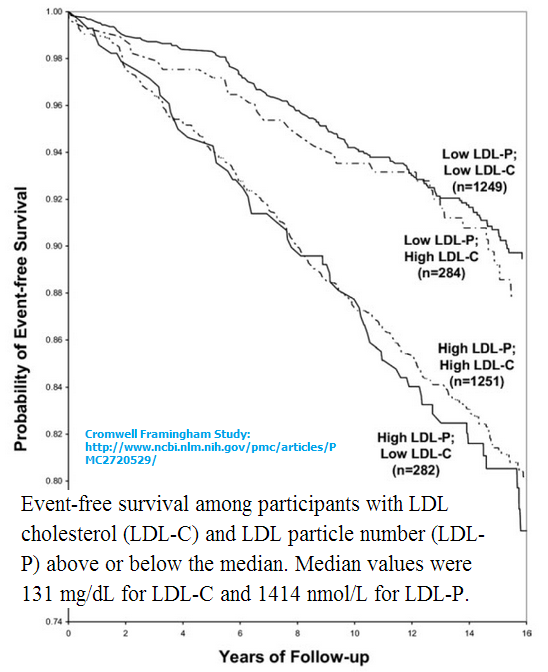 I think figure 3 in Ridker's paper on LDL cholesterol (http://www.thelancet.com/journals/lancet/article/PIIS0140-6736(14)61009-6/fulltext) is pretty interesting. It compares 26 different lipid fractors as predictors of cardiovascular events in women. Interestingly, the authors of this are John Edward Swartzberg and none other than Ronald M. Krauss! A while back on another forum, this guy was challenging the paleo-minded folk on producing actual evidence showing that a carbohydrate-restricted whole foods diet would lower inflammation more than a plant-based whole foods diet. I provided some papers on the benefits of pescetarian dietary changes, However, as far as 'enjoy the red meat and butter' spiel went. Yeah, the plant-based offerings were the overall winner. The narrative seemed clear: Want low lipids and low inflammation, then centre the diet around plants. And that's the interesting thing. Aside from the outright anti-cultural quacks, one would be hard-pressed to find a vegetarian or vegan diet-advocating doctor, living in blatant denial of the basic reference range for cardio-metabolic markers. Despite their near-reductive fixation on cholesterol, they're not telling their patients to ignore their inflammation, glucose and lipid markers, but rather the opposite, as they're showing off results on these very wide-ranging parameters. The review system applies across the board to all products. What happens after is a matter of who's selling what and how many people within the circle jerk can support their product and create the illusion of 'perfection' through disingenuous reviews. Nice update. I am just a bit curious about your HBA1C. Has it always been around the mid-5 range? This bears repeating. The burden on the low carb advocates is high for many reasons not the least of which being they often counsel against those markers that are inconvenient. But why would they do this for only certain products? I have read a lot of negative reviews on Amazon, and they seem to be accurate because there's consensus among the negatives. This is puzzling to me. The removal of my review is very disconcerting. I did not receive notice of removal so the only way I was informed was because Heath Squier apparently noticed. The ultimate "resolution" was confusing as it stated the review was OK and would not be removed ... well it already had been. I was told to resubmit but it's been well over the 48 hours and no notice. I don't have the time today to track this down but I plan to. They think over 50 is 'meh, not bad but can be lower'. So, yeah. I am assuming that certain back-handed tactics were used (likely by the promoters of these products) to get those reviews removed. I doubt that this was just Amazon. I think that it's actually just that true-believers are flagging dissenting reviews as "abuse". It happens for political books, too. With people who are myopically focused on inflammation alone, I often ask them to imagine they have a splinter/sliver in their finger that has become infected: What's causing the infection? "Inflammation" in and of itself? Or that filthy piece of wood embedded in their skin the inflammatory process is responding to? Remove the splinter, clean the wound, and the inflammation goes away, avoiding gangrene and further catastrophe. Likewise, sufficiently lower the LDL lipoproteins and other atherogenic particles, and the atherosclerosis goes away. No heart attack. Speaking of Dayspring, he mentions in one of his YouTube videos that CRP is too general a biomarker for CAD, because any infection in the body can cause CRP's to elevate. He says we need to find a more specific biomarker for diagnostic purposes related to CAD. The 'true believers' getting rid of negative reviews would make sense because the Nutty K crowd seems even more rabid than the average low carber. "My recent heart scan results were 50% lower (= better) than predicted. Apparently I am doing something right. You might think that my lipid values would reflect that. Not quite. They were measured twice in the last two weeks, first with a Cholestech LDX machine (instant results); second, ordinary lab tests. Here are the scores (first test, second test). Total Cholesterol: 210, 214, which is “borderline high” (borderline bad) according to the Cholestech LDX quick reference sheet. HDL = 17, 36, which is “low” (bad). TRG = 62, 75, which is “normal”. LDL = 180, 163, which is “high” (bad). There is no hint in these numbers that I am doing the right thing! If anything, they imply the opposite, that I’m doing the wrong thing. This supports all those people, such as Uffe Ravnskov, who say the connection between cholesterol and heart disease is badly overstated." is more of the explanation offered by Chris Masterjohn, i.e. the oxidized LDL hypothesis, which you also have discussed before in http://carbsanity.blogspot.co.uk/2012/03/live-blogging-from-paleo-summit-ix.html#more. Also, read this for the lack of benefit of saturated fat restriction in the long term, http://wholehealthsource.blogspot.co.uk/2009/07/diet-heart-hypothesis-stuck-at-starting.htm. To put things into perspective, below is an anecdotal evidence, albeit one with a scientific approach. I had high LDL (6.2 mmol/L) and elevated serum levels of alanine transferase (ALT), 63 u/L and subsequently increased to 93 u/L, indicating worsening liver damage. So, naturally I'm worried and seek to find the root cause of the problem. I experimented with low carb (silly me) and after excluding NAFLD (using ultrasound scan), I was at my wit's end as the two said parameters are still very high. Then, one day I recalled reading Colpo's writing on iron levels and CHD. In one of the clinical trials he cited, drop in cholesterol level was found as an unintended consequence of iron lowering, which led me to test for my serum ferritin level. Lo and behold, I have extremely high levels of serum ferritin levels (648 µg/L) ! Regardless of the cause, I knew I had to lower my iron levels immediately, deferoxamine and phlebotomy are out of the question for me, the former's risk outweigh the benefit and the latter is not practical. So, I resorted to IP6 (a.k.a phytic acid) in the form of Ca-Mg salt, increased activity level and consumption of green tea with every meal.In a period of JUST one month, serum ferritin levels dropped from 648 µg/L to 388 µg/L and LDL dropped from 6.2 to 4.0 mmol/L (a reduction that rival that of statin ), but most importantly my ALT dropped to 22 u/L, which essentially means that I am cured of my liver damage. 388 µg/L is still above the normal range, but unfortunately I have stopped doing tests on all the parameters after that, but I'll keep u posted if I ever I got back to testing. Exercise and consumption of green tea couldn't explain the dramatic reduction in iron level, as I was basically 'non-compliant' for the former due to my busy undergraduate course schedule and the latter (green tea with meals) probably didn't even make a dent in iron levels in such a short time of 1 month. I am not promoting the sale of IP6 or whatever, I used IP6 because based on my reading of the scientific literature, IP6 is my best and safest bet to lower my iron level, given my circumstance. I hope you can appreciate that we have bigger fish to fry when total choleterol level is below 5.0 mmol/L or maybe even 6.0 mmol/L. Oxidation of LDL seems to be the real culprit in CHD aetiology, as opposed to mere TC level. Furthermore, the correlation between LDL level and CHD does not even begin to meet Hill's criteria for causation. individuals would derive clinical benefit from more intensive LDL lowering than would have been indicated by their LDL-C level. Data from statin intervention trials are needed to test this hypothesis. Charles, how long you been taking Cypionate and do you know the dose? Your A1c is high for someone with good FBG / FI and eating healthy. Do you have A1Cs prior to being on Cypionate? Also, what are your Hemoglobin, RBC and Ferritin numbers? I have a feeling A1c may not be accurate because of low RBC turnover. But the real upshot from your blood lab is your high-normal LP-PLA2 and moderately high Homocysteine and CRP, despite having very low LDL-C and moderate LDL-P. Do you know your MTHFR status? Take B vitamins? You have some good numbers but your risk is not as low as they should be because of what might be endothelial inflammation -- that's probably why your CRP is 0.9. For someone like you, its should be 0.1. You have some inflammation but it's not metabolic and it could be genetic, autoimmune, or drug induced. Did you have your spleen removed? Seth knew a lot about behavioral conditioning but knew dickens about blood labs. He started attributing the decrease in his CAC score to his butter-eating. Turns out the CAC is subclinical unless you're 55-60 or higher. The test can be very misleading for someone younger. His TC was low and LDL-C probably moderate. But another one of those cases with probably high LDL-P masquerading as low LDL-C. If he devoted his time learning about and interpreting his blood labs instead of playing stupid human tricks with butter and flaxseeds, he would be alive now. Holy, where did you dig this out of? His HDL was 17 and 36 when his TC was 210/214? That's the best predictor of your heart health right there: TC / HDL of 12.3x and 6.0x. These numbers are terrible. I mean his HDL isn't even 8% of his TC in the first test. No wonder he kicked the bucket. And his LDLs are high; I thought they were low! So his LDL-P would have been high and correlated pretty well with his high LDL-C. Stuff yourself daily with SAFA from butter and your deepening atherosclerosis would erupt in a fatal thrombosis down the road and it sure did. He misinterprets both the CAC test when it's subclinical (soft plaques) and the 50% change which he attributes to amelioration. Those numbers are meaningless unless you're old and should be interpreted as either / or. When you're in your low 50s and it's not zero, it indicates some problems. It should be zero if you're under 50. But the non-zero numbers themselves are meaningless. Then he misinterprets TC going up from 210 to 214 as bad, when it is achieved through higher HDL and an improved Framingham ratio: TC / HDL. His low trigs are not gonna save the day when his numbers are that bad. This is the health guru that Paleo looked up to? This is just so sad. And the best he can do is backslap Uffe Ravsnkov in his ignorant bliss. I would love to see his WBCs, components, total protein, globulin, liver enzymes, and the CBCs. Getting Gary Taubes' blood test was like pulling teeth. Yet he left out the CBCs which could show his deteriorating hormonal and immune health. His TC was over 200, his LDL was high and his HDL was low. He was told that his results were bad; there was no need to learn to interpret them. He just thought the "mainstream" interpretation (i.e. that his numbers indicated a problem) was wrong. Actually, previously, he had said his HDL was low but his LDL and TC were "good." I'm sure I can dig that up. But they're disproven by the numbers Charles dug up below. His HDL is low and his LDL-C is high and his TC aren't "good" as he claimed when it's mostly LDL-C and only 8% HDL. The guy had CVD issues and worsened it by gorging on SAFA. Plus I bet getting up from his bed and sitting up on his desk consisted of his daily exercise. Until later, that is, when he died while hiking. Dayspring does understand that CRP is not specific. Basically just look at Trigs. If your trigs are low and your CRP is ~1 or >1, then you have non-metabolic sources of inflammaiton, which could be many: autoimmune, hormonal, drug induced, genetic, etc. Compare that with ESR which is also non-specific, and you can tell a lot about the sources of inflammation. ESR creeps up with age but when combined with CRP, Lipids, liver enzymes, CBCs and hormone panels can signal where your sources might be. The problem with Paleo and low-carb GPs like Teri Wahls, Michael Eades, Shanahan, et al is they cannot afford to admit that you can end up with inflammatory conditions with very low trigs. For most low-carbers, it's very often hormonal and autoimmune related. They may have trigs under 70 but their CRP isn't under 0.3, which it should be if their inflammation source was purely metabolic. By the time Seth died, his most recent blood lab was like 2 years old. Jimmy Moore asks to be a charity case when he wants his blood drawn. These guys are obsessed with blood sugar and constantly measures BG as if that will exclusively determine their longevity. What's funny is when you ask them, when was the last time you had your hormone panel or ANA done, they're completely clueless. These moron only look at 3 things: HbA1C, FBG, and Trigs. If only life was that simple. Since most don't even have insurance and if they do, they're being crimped by punitive HMO coverage, these idiots don't even know their liver enzyme or blood counts. Did you review Keto Clarity as well? Hmm. Do I really have to go there? Lol. Cheers for linking. I saw the comments and the usual circle-jerk response. Yes, and that was the intended underlying message of my original post. I think that the Amazon review system is open to abuse. Both in terms of cabals of individuals (with mutual interest) reviewing each others products and creating this false illusion of perfection. Hence circle jerk. This is followed by basically ganging up on and down-voting any dissenting opinions and when that fails, even manipulating Amazon's administration into deleting the dissenting opinions. It seems like that the NuttyK crowd was behind the removal of some of these reviews. The high LP-PLA2 is of concern - any ideas as to how it could be lowered? so much good info, post and comments. I posted a pretty long comment yesterday and I dunnoe know if it went into spam or got removed, it seems comments that are submitted after me are posted already, but mine is nowhere to be seen. If you don't want to entertain my comment, can you at least approve it to be posted and I am sure your readers can chip in. As far as I am aware, my comment was civil and relevant to the topic of your post. I would really appreciate, if you could do that, thank you. Your high Hb is a possible clue; A1c could be overstated. But there are mixed signals (adiponectin might be too low and imply lack of insulin sensitivity or endothelial inflamm.). You check your 1-2h post-prandials? How high do you go up? I'd ask for Fructosamine next time to see if that matches your mean BG (125) indicated by your A1c. Fish oil is anti-inflammatory if you believe in n6-n3 theory, which is not proven. How are your liver enzymes: ALT/AST should be in the teens if you have no metabolic inflammation. Your Albumin should be >= 5, your Globulin I bet is right around 2, low normal, given your 4ish WBCs. For Homocysteine, >13 could be problematic and maybe 6-8, 6-9 are optimal. Your TSH/FT3 ok since taking Armour? See any bump up in WBCs after taking it? I'd ask for ANA and ESR next time. I hear you, man. Any time I get the feeling that we've got a bit of group-think going on here, I realise just how many minor and acceptable disagreements we have on a wide range of issues. The consensus, if any, seems to be against knee-jerk rejection of medical reference ranges for the sake of convenience and spite. I have to play devil's advocate here. Is the graph above age-adjusted ? As far as I know, the 1st graph comes from the Framingham study in which the statistical correlation between total cholesterol and CHD is high only in those aged below 50, but 95% of CHD deaths occur in those above 55 yrs old. of CHD deaths in FH individuals and not the high cholesterol level. I'm pretty sure you've misrepresented Peter Attia here. He is not on board with the particle size theory, rather he is firmly in the particle count camp, as concluded by the researchers from the paper the graph appears to be from. Dr. Oz has some weird theatrics. I interpreted that as Dr. Attia agreeing to the large number of LDL particles causing endothelial damage as opposed to strictly based on size. Or perhaps he was too mesmerized by Dr. Oz's "weekday afternoon residency at the Golden Nugget" style of TV theatrics to clarify? First, the visual is inescapable. You have your single bouncy ball that rolls along, and then a ton of small balls which he then uses to tear up the vessel wall. Once it gets into your blood, if it's in a BIG form of cholesterol like this, this cholesterol rolls through your artery represented by this, and without any problem flows out of your body, or where it needs to go. Attia looks along with dumb look on face. Speak up man. Nah. It's national TV exposure. Words can't describe the palm hitting my face from watching that video. I am surprised at the lack of response to the points (with references) I raised below, which reeks of 'cognitive dissonance' on the part of carbsane and the frequent commenters. In the case of FH, with the loss of the cholesterol receptor, the impaired ability to absorb cholesterol is likely to impair flexibility of cell walls in arteries, making them more brittle and therefore more liable to hydrodynamic damage and thus arteriosclerosis. Therefore, FH is not applicable to the rest of us. Furthermore, high rate of CHD in FH is not consistent from generation to generation, suggesting the role of environmental factors. If anything, serum ferritin level should have been the one that deserve mainstream attention, as its correlation with CHD is consistent across populations and cultures, while the correlation of LDL with CHD is only strong in industrial populations, suggesting that LDL's contribution is highly dependant on environmental/lifestyle factors. Firstly, I am very sorry for the lack of response. For the past month or so we have been dealing with end-of-life terminal illness of a family member and I am not always around to begin with. Generally I've been trying to comment here on my own blog when I get a chance rather than trying to go back in the queue and answer comments in the order in which they were received. Even with that I've been somewhat scarce. I read one of your references and had intended to read the full text before responding -- the one with the reduction of risk with age. Could that be interpreted as the more vulnerable having already died off? I didn't have a chance to look closely enough. One of the issues with saturated fats is that one way they raise LDL levels is via the cholesterol receptor. I have been sent a number of additional references on this topic and many still point to LDL *per se* remaining a good predictor of CVD. Take that to LDL-P or apo-B (associated with LDL) and the predictiveness strengthens. Is it the LDL or some underlying metabolic milieu that causes it? That's what folks continue to try to sort out. For now I'd hedge my bets carefully and think it is irresponsible of those who promote the notion that LDL is meaningless. Really sorry to hear about the plight you are dealing with and I apologize if I come across as rude, but I have no such intention. My comment wasn't directed at you or anyone specifically, but rather to the lack of discussion of conflicting findings (whether the findings are actually conflicting, we can always discuss) by everyone. FIrst of all, I have to clarify that my dietary approach is very moderate (neither low carb., low fat nor high fat) and I am not saying that LDL level is totally meaningless (I think context matters ), but I definitely disagree with the rather reductionistic view of the correlation btw. LDL and CHD. I subscribe to the oxidized LDL (oxLDL) hypothesis, so I am aware that high LDL will inevitably lead to high oxLDL, but the cut-off point would be 6.0 mmol/L. My view is that, in the high fat, low carb (HFLC) circles, most of them do not believe in CICO, hence in their hypercaloric and high fat context, all of that fat must go somewhere, hence hypercholesterolaemic-like LDL level, so it is unfair to blame satfat in this context. Regarding saturated fat, I think in the context of a moderate fat intake, the downregulation of cholesterol receptor is balanced by the reduced susceptibility of LDL to oxidation. Furthermore, prospective studies seem to show there is no benefit to satfat reduction in the long-term. On the other hand, the upregulation of cholesterol receptor with PUFA could very well be a physiological response to elevated oxLDL. No worries, you weren't rude. If I harken back to my days at Paleo Hacks I'm reminded of so many who saw their lipids soar when adopting the high "paleo fat" diet -- coconut oil and butter. How butter became paleo is beyond me, but these high sat fat fats almost invariably threw lipids outta whack. All LDL-receptor mediated? I don't know. But in LA Veterans they consumed 40% fat of mostly PUFA -- and crappy PUFA at that as rather than consuming different foods high in PUFA, they made the diet as similar to a regular one as possible with margarine, "filled milk" and the like. LDL went down. I dunno. I would love to delve more deeply into this but it's not top of my list of interests at the moment. For me, a woman whose LDL has always been "a bit high" (as in borderline by the established ranges) with robust HDL (not out of the ordinary high either) resulting in a TC that has flirted with being higher than "optimal" since I was 19 and got my first TC test, I am more interested in changes than absolutes. If I adopted a diet and my LDL took off into FH ranges, I'd reverse course .... not write a book and take enough people out of context to convince myself that not only am I not taking risks with my health, but am somehow healthier with a whack lipid profile. Thanks much for the studies. I hope to revisit them! Charles, sorry, lost track of all this. You do have inflammation and it seems to be mainly hormonal (possibly autoimmune) and slightly metabolic. Unless you have drinking history (or prior liver injury), someone lean like you should have liver enzymes in the mid-teens, and your albumin should be higher. No issue with globulin. Is your hypothyroidism Hashimoto's or the euthyroid variety? Without Armour, does your TSH climb above 3 or 5? Do you have cold hands/feet, low body temperature? You have enough FT4 but your FT3 is "only" mid-normal but your RT3 is high. Naturopaths will interpret your blood work as if your FT3 is being siphoned off to RT3, and your FT3 should be in the upper quadrant. Your FT3/Rt3 is only 8, while it should be >10 or >20. This is all still crapshoot. If you have hypothyroid symptoms, then maybe that's happening. But the FT3/RT3 ratio and the FT3 level themselves defy interpretation and sometimes are symptomatic of generalized hormonal dysfunction, not just thyroid hormone dysfunction. That's why knowing your health history and whether you indeed were hypothyroid (based on TSH), have autoimmunity, i.e., Hashimoto's, are important. If you listen to naturopaths, the catch-all answer is thyroid, since all they know is the Ft3/Rt3 ratio. Are your symptoms being addressed sufficiently by Armour? EasyHits4U - Your Free Traffic Exchange - 1:1 Manual Exchange Ratio, Business social network. Get FREE Advertising!